Akira's aunt from Yokohama. She is a relative of Akira's mother, Sakiko. 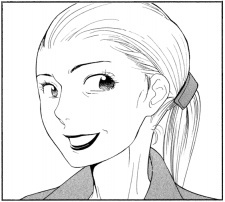 She is a very condescending woman and seems to like proper young ladies, an image of which Akira is exactly the opposite embodiment. She holds Akira's mother in somewhat low esteem as well though she seems pleased with Akira for gaining entry to Fujigaya Girls' Academy. Keiko is an alumna of the prestigious school and so is glad that her niece has made such an accomplishment. Akira is dead terrified of her. Keiko insists that Akira sends her future invitations to Fujigaya's cultural and drama festivals; the idea fills Akira with absolute dread. She ends up seeing Akira's performance in The Deer Cry Pavilion which she regards with much scrutiny and apprehension.